This image is sponsored by Ama. The Grace Obelisk is available at the Cosmopolitan event starting today until the 11th of August. The Obelisk is 1 land impact each and they are resizable, I personally liked giving the white one a different color. Hanging on the Obelisks are the Ama. : Robin Harness and they come with a hud obtaining 5 leather options, 5 stone options, and 5 chain color options. This harness is a wearable item and is fitted for the Maitreya mesh body. 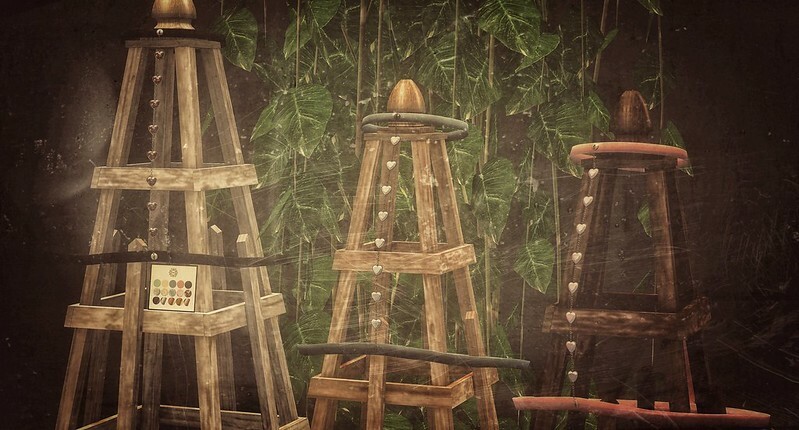 You can find the Harness at the Blush event until the 18th of August. The plant in the background is from Soy and is called the Super long Hanging Hedera.